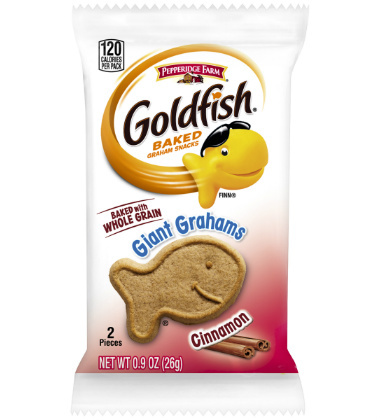 Crunchy cinnamon flavored Goldfish Giant Grahams go for a dip in a cup of cool, creamy strawberry yogurt with a blueberry smile. low fat fruit flavored yogurt	 3 qt. 1. Place small serving plates on sheet pans. Put small serving plates on the pans in an array. Top each plate with a 4 fl oz serving cup. 2. Use a #8 scoop to portion 1/2 cup (4 fl oz) of fruited yogurt into each serving cup. 3. Open Cinnamon Goldfish Grahams packages and carefully remove the grahams from the packages. 4. Put one Goldfish graham on top of the yogurt in each serving cup as shown in recipe photo. Put one Goldfish graham on the serving plate next to each cup. 5. 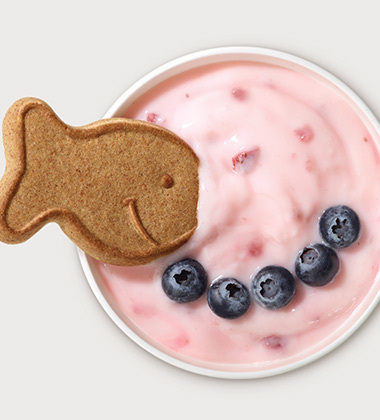 Place 5 blueberries over the yogurt to create an extension of the Goldfish smile. 6. CCP: Serve immediately, or cover sheet trays with paper and hold for cold service at 41 degrees F or lower until served. 3. Put one package of Cinnamon Goldfish Grahams on each serving plateon the side of the yogurt cup. 4. Add 5 blueberries to each serving plate on the other side of the yogurt cup. 5. CCP: Serve immediately, or cover sheet trays with paper and hold for cold service at 41 degrees F or lower until served. 6. Post a picture of an assembled menu item OR display a sample assembled Gone Dippin' on your serving line to inspire students to create their own. For a recipe for 24 portions, you will need about 2-1/2 cups of blueberries, or approximately 13 oz. For a complete reimbursable school lunch for grades K-5, offer this menu item with an additional 1 cup fruit, and 8 oz of milk. Try substituting vanilla low-fat yogurt for fruit flavored yogurt in this recipe. Nutrients per serving: 203 caloires, 3.9 g fat, 1 g saturated fat, 0 grams trans fat, 5 mg cholesterol, 194 mg sodium, 36.4 g carbohydrate, 1.3 g dietary fiber, 5.1 g protein, 4% DV vitamin A, 1% DV vitamin C, 25% DV calcium, 11% DV iron.